During 2017, Grain SA entered into a Service Level Agreement (SLA) with the DRDAR in the Eastern Cape. The overall purpose of the agreement is to establish working relations and partnership in terms of supporting the development of subsistence and smallholder farmers to increase their yields to commercial yields, and to contribute to the sustainable development of rural communities and food security for all around the grain production projects; to identify and support local contractors so as to build mechanisation capacity within the communities; and to develop and capacitate graduates with practical exposure to grain farming. An estimated 16 million South Africans live in poverty and the highest incident is among female-headed households in rural areas. Poverty eradication and wealth creation under an ideal free market system depends on economic growth of sectors. This could be because the growth of one-sector leads to the growth of another sector i.e. the growth of raw materials suppliers has been growing with the growth of those who process the raw material. Consequently, South Africa today has two very distinct economies in most sectors i.e. the developed economy also referred to as the first economy and the developing economy also referred to as the second economy. This dualism cuts across all agriculture sectors, sub-sectors and commodities including the grain sector, which is the focus of this project. A higher proportion of the population is regarded as being food insecure, with severe malnutrition on children. The objective of this SLA is for Grain SA to engage contractors to assist farmers on 3 656 ha to plant their crops (as per the Jobs Fund Project principles) in the communal areas of the Eastern Cape, for the purpose of producing maize for household food security and to sell any surplus that is produced so as to contribute to income generation for these farmers in the deep rural areas. Farmers make their own monetary contribution on a per hectare basis. The input supply companies (Monsanto, SA Lime & Gypsum, Kynoch, Syngenta and Villa Crop Science), are providing a discount on the inputs; the Jobs Fund is contributing part of the cost of the inputs as well as the cost of the mentoring. The contribution from the DRDAR is to pay contractors to prepare the fields, plant and spray the crops for the farmers in the Eastern Cape. Grain SA shares knowledge and information, ensures effective monitoring and evaluation of programmes and develops a reporting system in respect of the projects embarked upon. 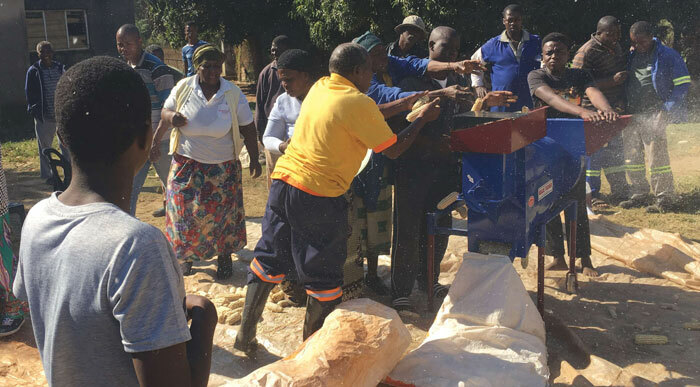 Unemployed graduates from within the targeted areas were recruited and contracted to Grain SA and funded by DRDAR. These graduates worked very closely with the mentors in the area, gaining valuable hands-one experience while at the same time attending training courses that were appropriate to their needs. In the Eastern Cape, the Grain SA programme operates from the five districts namely: Alfred Nzo, Amathole, Chris Hani, Joe Gqabi and O.R. Tambo. It is further envisaged that the grains produced by these farmers could supply the Agri Parks in the province (once they are operational). Many of the farmers in the deep rural areas do not have their own mechanisation and they cannot afford to pay the costs of contracting. Through this agreement, Grain SA will be able to assess and contract local agricultural contractors to assist the farmers with land preparation, planting and spraying of land, (farmers who are part of the Jobs Fund Project and other similar projects who have paid their dues). Identify all the participating farmers with the support of the department. The participation of farmers is dependent on their making their financial contribution to the project by 31 July each year. Receive the contribution from each farmer – the farmers deposit the money directly into the Standard Bank account opened specifically for that purpose and sign a job fund agreement, or other appropriate agreement. Order the correct inputs for the farmer; appoint mentors to support the farmers in the field; train the farmers on production and marketing. Assist the farmers with the marketing of their surplus. Identify suitable, capable and equipped contractors to prepare and plant the designated fields for the farmers. Assess the equipment of the contractors and ensure that they have the capacity to do the work assigned to them. Support the contractors throughout the process to ensure that they perform their tasks to the required standards. We believe that this project is being a success. The fact that local farmers and tractor owners are being empowered to develop as contractors will ensure that crop production will be able to continue long after the duration of this project. It is very important to use the local people as the service providers as they live within the community and are part of the people they are serving. Their delivery, or lack thereof, will impact on their standing in the community and this factor alone drives them to do a good job. The programme of empowering the graduates is very necessary – there are a large number of young people who would like to be part of the sector and who have studied at the academic institutions. However, it would appear that the universities and colleges no longer do any practical training and so after graduation, they are not able to be of much use in the field as they only know the theory of everything and have no experience. Through the relationship that we are building with these interns, we are exposing them to the practical of farming and opening their eyes to real farming and the real challenges being faced by farmers every day. We are most appreciative of the co-operation that we have with DRDAR and we look forward to assisting them to build this sector in the province – together we can do more. Article submitted by Jane McPherson, Farmer Development Programme Manager, Grain SA. For more information, send an email to jane@grainsa.co.za.